Bharat Institute of Technology, Ranga Reddy has advertised for the recruitment of Professor / Associate Professor / Assistant Professor / Director / Dean jobs vacancies. Interested and eligible job aspirants are requested to walk-in from 09th to 16th December 2018. Check out further more details below. 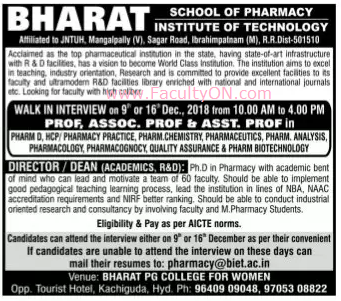 About College : BHARAT INSTITUTE OF TECHNOLOGY-PHARMACY (BIT), Hyderabad was established with the objective of imparting quality pharmacy education in India. The mission statement of the institution was defined in the year 1999 and it was decided that the institution would strive hard to have a fully equipped Postgraduate studies and Research centre. Today the college is one of the largest postgraduate and research institutions in India, imparting quality pharmaceutical education at graduate and postgraduate level. How to Apply: Interested and eligible candidates are requested to attend the Walk-in interview along with their CV, all originals / copies of certificates, PAN card, Aadhaar card, experience / relieving n certificates and recent colour PP size photos to the following walk-in address.